Now that every major studio produces big-screen computer-animated movies at least semi-regularly, it’s a small but appreciable miracle that stop-motion animated features still occasionally appear on thousands of screens nationwide. This flies in the face of most economic realities of animation: Hyperbolic action, non-stop yammering, and frantic flattery of both a child’s idea of sophistication and a parent’s idea of child-friendliness are more affordable to produce than ever, and stop-motion takes enormous time and effort to limit exactly those qualities. This doesn’t make them automatically good, but it does make them automatically different; has a stop-motion feature ever been described without using the word “painstaking”? This is not to say that Missing Link, the new stop-motion feature from the masters of the form at Laika, is a study in stillness. There are slapstick bar fights and actual cliff-hanging. There are celebrity voices, including Zach Galifianakis in full (if genteel) rambling mode. Even the animation itself is noticeably smoother than some past stop-motion classics, with animators’ fingerprints less visible just outside (or sometimes fully inside) the frame, as Laika continues to push forward with its own medium-specific technological advances. But the movie also has the freedom of its constraints. It operates on its own little wavelength, rather than broadcasting itself loudly. 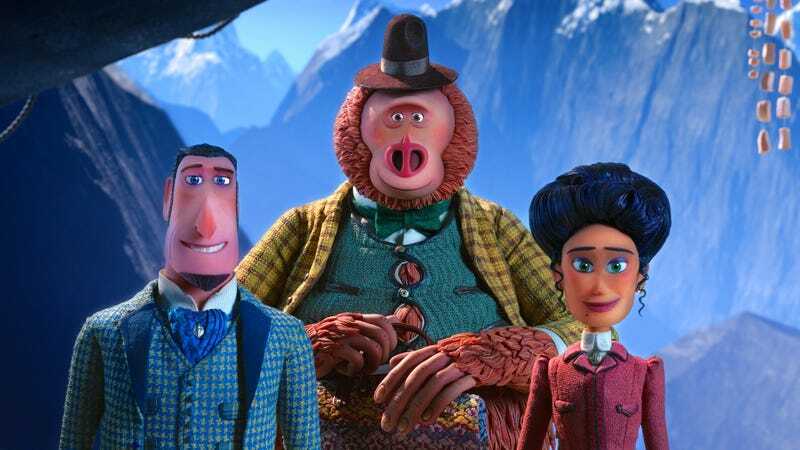 Missing Link lightly kids a sense of faux-decorum, very much present in Sir Lionel Frost (Hugh Jackman), an adventurer who the movie joins in pursuit of the Loch Ness Monster. After some light complaints about the poor quality of his travel tea, Frost blithely places his assistant in danger (right into Nessie’s jaws, in fact), then must rescue him. They emerge from the mission basically unharmed, but without any concrete evidence of the creature—something Frost is convinced would grant him instant admission into an elite explorers’ club. Forever concerned with attending to his respectability, Frost gets another shot when he receives a letter beckoning him to the American Pacific Northwest, enticing him with a chance to glimpse the fabled bigfoot. It’s quickly made clear that the bigfoot, a soft-spoken and lonely missing link named Susan (Galifianakis), wrote the letter himself, hoping Frost might help him find more of his kind—specifically, a tribe of yetis living in the unseen Himalayan land of Shangri-La. Frost agrees to bring him there in exchange for proof of Susan’s existence. For travel purposes, Susan is disguised and re-dubbed “Mr. Link.” The pair is joined by Adelina Fortnight (Zoe Saldana), who has the only known map to Shangri-La, and they’re all pursued by Stenk (Timothy Olyphant), who has been charged with making sure that Frost is not vindicated. The journey walks a line between a swashbuckling adventure and a gentle picaresque. Director Chris Butler is dealing with more locations than past Laika movies, something the studio has trumpeted in press materials, and with good reason: As ever, they’ve handcrafted (and computer-augmented) a world of painterly detail and sometimes astonishing color. Missing Link (which displaces Kubo And The Two Strings as Laika’s least ghoulish, least spooky movie by far) makes especially vivid use of more autumnal hues. Mr. Link himself, with his fur matted into leaflike clumps, looks a bit like a tree bursting with orange leaves—albeit one squeezed into impeccably tailored Victorian clothing. But some of Missing Link’s loveliest images pass by without as much impact as some of the studio’s smaller-time adventures; there’s a gorgeous moment with the characters atop a monkey-steered traveling elephant, for example, but it’s barely a scene. Butler’s previous film as director, ParaNorman, made sure that dilapidated neighborhood houses featured no properly straight, flat lines, while The Boxtrolls hid a whole world in the nooks and crannies of its cobblestone streets. The world of Missing Link feels a little more fleeting, a little less rooted in characterization, at least on first viewing. The character population also feels sparser, maybe because the relationship between Frost (who is terrible at considering the feelings of others, but basically a good man) and Susan (who is literal-minded, but not incompetent) is a little soft, even polite. Their dynamic is charming, to be sure, and a welcome respite from the forced buddy routine of so many animated comedies. It’s just closer to second-tier Aardman drollery than a top-shelf comic duo. In his self-centered desire for acceptance into an old boys’ network of dopes, Frost somewhat resembles Ben Kingsley’s wonderfully grotesque Boxtrolls bad guy. But the character’s status as the flawed hero, rather than the semi-tragic villain, oddly limits his pathos, as well as Laika’s sociological observations, which have been sharper than they are here. 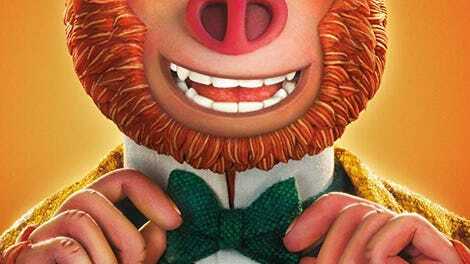 That’s all to say that Missing Link is only—only!—a sweet, distinctively animated bit of all-ages entertainment. That it’s appropriate for an even younger audience than their past triumphs makes it a valuable point of indoctrination, too. Complaining about the exact size and specifications of another Laika miracle may be beside the point.